If you feel as if something is missing from your home, it may just be that perfect rug that will complete the look and feel. No matter what mood you want to create, at Carpetright you will be able to find the rug that fits perfectly with your decor. 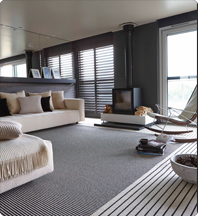 We offer a wide collection of high quality contemporary, traditional, modern, classical, natural and textured rugs in various colours, sizes, designs, shapes and materials. We’re sure that you can find a perfect match. Whichever rug you’re looking for, your first step is Carpetright. Add class and sophistication to your home with a rug from our stunning Opulent collection. Available in 5 colours, you can be sure this modern rug will complement any room in your home while also providing maximum comfort and warmth underfoot.